Happy Thursday everyone!! Woohoo, weekend is a comin’! We are back in AZ for some fun family activities this week. It’s going to be so nice spending time with our family. Gotta love the Arizona summers, yikes! This recipe was a perfect example to me that you shouldn’t judge a book by it’s cover. At first glance these aren’t crazy beautiful, but can I just say they are worth every calorie?! They are buttery, white chocolate-y and Kit Kat-amazing. 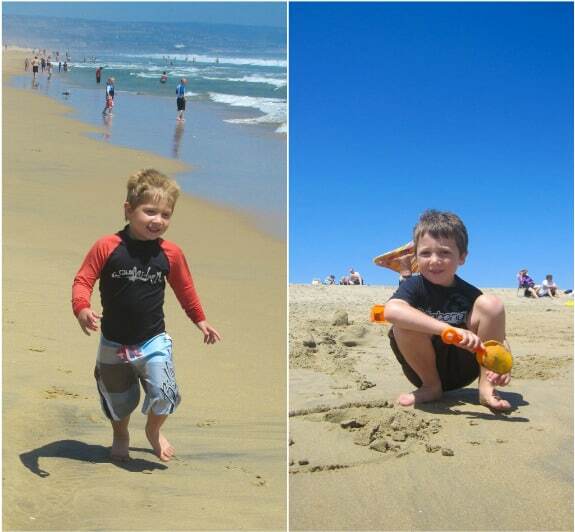 We really enjoyed them. 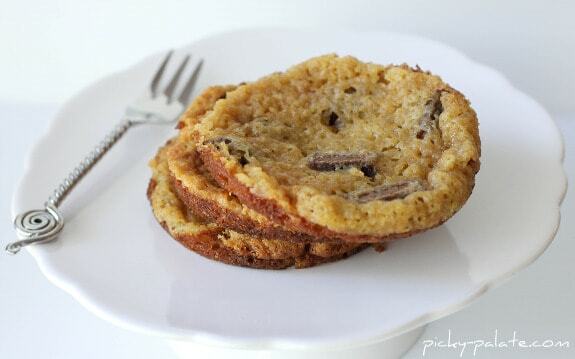 I broke out my trusty Muffin Top Pan again and it was fun to eat cookie shaped blondies. Give it a whirl or you can absolutely use an 8×8 inch baking dish. Either way….YUMMY! LOVE these darn candy bars! 1. Preheat oven to 350 degrees F. Place butter into a microwave safe bowl and melt. Stir in white chips until melted and smooth. Place sugar, brown sugar, flour, baking powder, salt and white chips into a mixing bowl, stir in melted butter/white chocolate then stir in eggs and cream. 2 options here: Option #1: Pour batter into a 8×8 inch baking dish lined with foil and sprayed with cooking spray and top with cut up pieces of kit kat bars. Bake for 30-35 minutes or until cooked through, let cool then cut into squares. 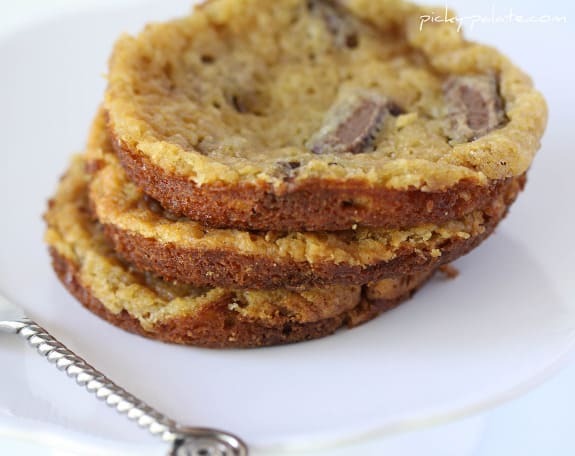 Option #2: Use a medium cookie scoop (about 2 Tablespoons) and place 1 scoop of batter into muffin top pan cups, then top with cut up pieces of kit kat bars. Bake for 20-25 minutes or until golden around edges. Remove from oven and use a plastic knife to clean up edges while it’s still soft. Let cool and remove from muffin top cups. it’s long time ago that I had kitkats! How fun!!! I want some of the muffin tin pans so badly! I love what you are making with them. I’m so excited! I used my swagbucks amazon cards to buy a muffin top pan and it should arrive this afternoon!! woohoo! I read this twice and I am missing when and how you add in the Kit-Kat bars? I really want to make these for my husband, who is in LOVE with white chocolate! Hi Jamie, you were absolutely right, I just edited the recipe….the kit kats are added right after you add the batter to the pans :). Thanks for catching that :). You read my mind with the kit kats! Love it. I’m going to do these in my whoopie pie pan! Oh, what an awesome idea!! 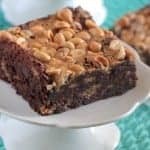 You inspired me to get a muffin top pan and I’ve not used it yet–I’d love to try a variation on these, maybe a different blondie recipe/candy bar. Thanks so much for the recipe and congratulations on the new blogging job!! 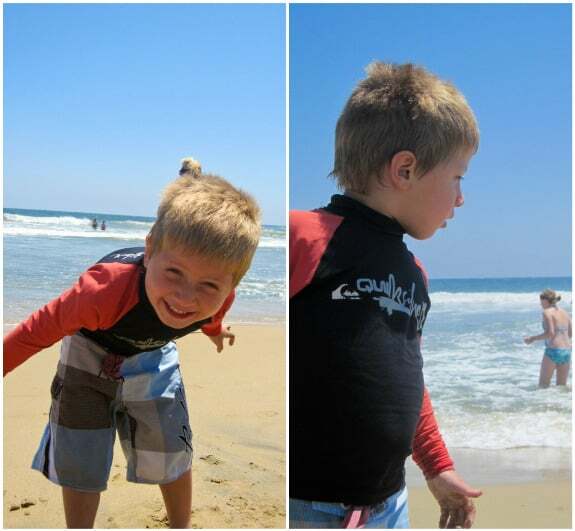 That little fork in the first picture is so cute! Great idea from someone to use their swag bucks go buy the muffin top pan….I’ll have to do the same because I’ve been wanting one for awhile! Great idea with the muffin top. Those blondies look delish! My mom is going to LOVE these! These are hands down her favorite candies. Thanks, Jenny! I’ll be making these today! You are REALLY selling me on this muffin top pan! 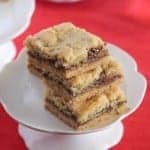 These blondies/cookies look amazing! Can’t wait to try. I’ve never used kit-kats in baking before but they were always my favorites! Congrats, and these look awesome – and WHAT A MUFFIN TOP PAN!!!!????? Those cookies look and sound way too delicious. I would love to make these to take to my friends lamb roast this weekend! I am sorry, maybe I am not reading this right…but…it says to melt the white choc. chips with the butter, but then it says to stir them in with the dry ingredients too (sugar, brown sugar, flour etc.) Did you divide the white choc. chips or is it just a typo. I think either way it would be delicious! I can’t wait to try these! You have great ideas!! Hi Bonnie, just edited the recipe so it makes a little more sense. You add normal white chips to the dry ingredients separate from the melted ones :). Hope you enjoy!!! Love the looks of these… You have so many creative recipes… Love them…. Are these regular size KitKats or the miniatures? Oh man Kit Kats are such a great idea!! They’re my favorite candy bar. These look so yummy. Great use of that pan. As always, you make me really hungry. I can’t wait to try these! Can’t tell you how amazing all your recipes are! Just love them. Quick question for ya, how do you leave your muffin top pan looking so new and clean? Looks like it’s never even been used….I can’t seem to keep my pans looking very clean…even when I just washed them! 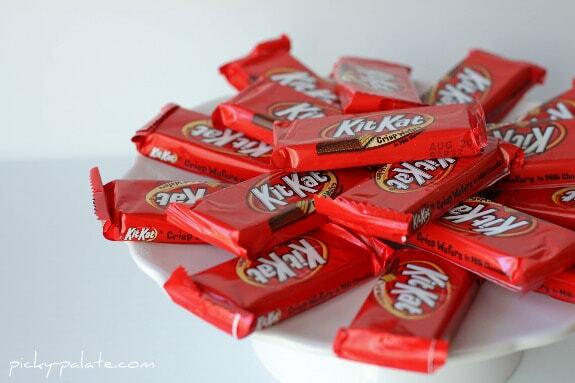 Josh loves Kit Kats, I will have to make these for him! 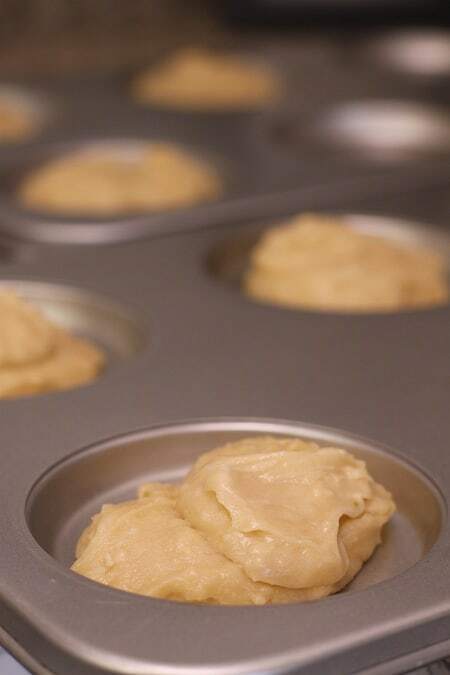 Well, thanks to your snicker cheesecake cookie recipe – I ordered two Fat Daddio (I love that brand) muffin top pans — now I have to print this recipe too! Yum. These look very yummy. I have a Kit Kat lover in the family. These look great! Love a good candy bar in cookie! It looks like you are going to the Baking With Betty event. I’m going too. Will be fun to meet you! You are ONE OF A KIND !!!!!!!!!! Love these! I just had a Kit Kat the other day, yum! Oh my goodness, Jenny! These look fantastic! I think these are adorable and love the shape of them. These look so delicious! 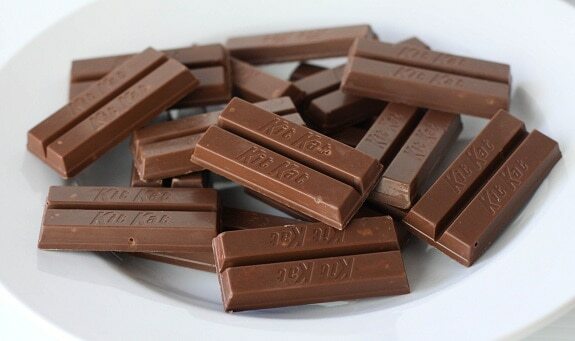 I love Kit-Kats. Made these today! I don’t know if I didn’t put in enough batter the first time with my medium scoop, but 20 min in the muffin top pan was too much. They got a little too crunchy. Second pan came out like a dream with a little more in each swell and cooked a little less! YUM! Thanks so much for the great recipe! Just made these today and they are so yummy! I love my muffin top pan. Thanks for posting such yummy creative recipes for this pan! ok so i love this recipe but i have tried making them twice and i cant get them to turn out the first time they were in the oven for 10 min and i burned them, and the second time i kinda burned them but they were fluffy not crunchy like a cookie, help me?? ?